The Trump administration says that water in California should be prioritized for wildfire response instead of endangered species protections, even though state officials say they have enough water to fight the fires. President Donald Trump tweeted earlier this week that California didn't have enough water to fight the wildfires. The Department of Commerce announced a directive on Wednesday that says the National Oceanic and Atmospheric Administration is taking over management of water in California in areas affected by the ongoing fires. The change announced Wednesday would allow federal agencies to expedite decisions about water under an emergency provision of the Endangered Species Act. 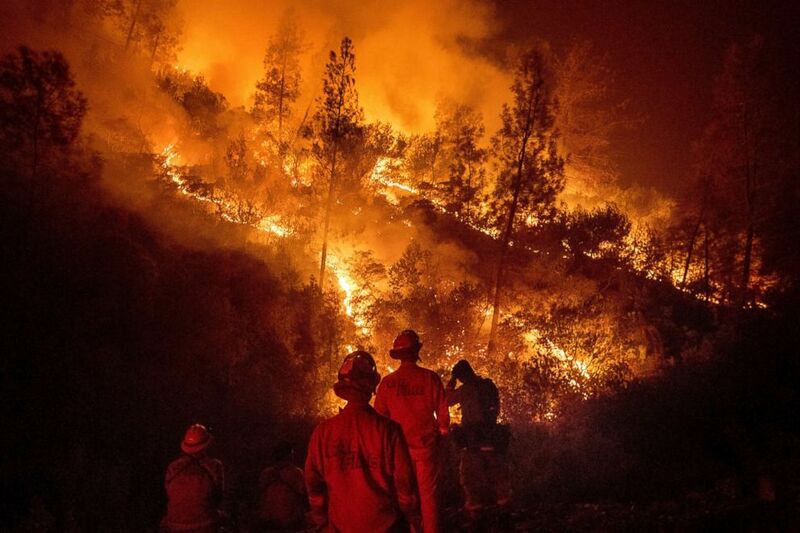 The directive specifically says that the National Oceanic and Atmospheric Administration, which includes the National Marine Fisheries Service, will take over management of water during the wildfire emergency in California. Commerce Secretary Wilbur Ross directed the Service to tell other federal agencies "the protection of life and property takes precedence over any current agreements regarding the use of water in the areas of California affected by wildfires." "Today I directed the National Marine Fisheries Service to facilitate access to the water needed to fight the ongoing wildfires affecting the State of California. One of the fires, the Mendocino Complex Fire, has developed into the largest in the state’s history, consuming nearly 300,000 acres in Northern California. American lives and property are at stake and swift action is needed," Ross said in a statement. But there is concern that the Trump administration is actually wading into a political conflict about water in California between the salmon fishing industry and farmers. The two groups have been going back and forth for years on whether water use should be limited to protect salmon populations crucial to fisheries or should be diverted for agricultural use. "Secretary Ross’s directive is nothing more than a smokescreen designed to weaken these protections that NMFS’s scientists determined are necessary to keep these native fish from going extinct. It’s almost like the extinction of these creatures is their real goal, so that they no longer have to leave any water in rivers, but can divert it all to corporate agribusiness. The people of California won’t stand for Trump destroying our precious resources to line the pockets of his corporate buddies,” senior director of the water division for the Natural Resources Defense Council Kate Poole said in a statement. The National Marine Fisheries Service works with California Fish and Wildlife to protect the delta smelt, a small fish that is seen as an indicator of the health of fish in rivers in central California, and Chinook salmon. The agencies work to reduce the amount of water that is removed from the rivers to protect the fish population. Secretary of Commerce Wilbur Ross issued a directive on Wednesday telling the National Marine Fisheries Service and other federal agencies to prioritize "the protection of life and property" over endangered species in the areas of California affected by wildfires, saying that public safety takes precedence. Trump commented on this policy at a campaign rally in Fresno in 2016, saying that California "shoves" water out to sea to protect the three-inch fish. Firefighters monitor a backfire while battling the Ranch Fire, part of the Mendocino complex fire, Aug. 7, 2018, near Ladoga, Calif. The directive says that NOAA, which runs the National Marine Fisheries Service, and the Commerce Department, are committed to finding "new solutions to address threatened and endangered species in the context of the challenging water management situation in California." In addition to his claims about California's water, Trump's tweets amplified a debate about whether more trees should be removed from forests vulnerable to fires. Interior Secretary Ryan Zinke wrote in an opinion piece on Wednesday that called for the government to actively thin forests to prevent too much fuel from building up that could exacerbate fires. "These fuels fill forests from the floor, where highly-combustible, dry pine needles act as kindling to jump-start the tiniest spot fire, all the way up to the crown where beetle-killed trees dot the mountains like matches. In between the floor and the crown, there are years’ worth of dead logs, overgrown shrubs and snags, which many firefighters call "widow makers" because they are so deadly," Zinke wrote in an opinion piece published by USA Today. During last year's fire season, Zinke issued a directive to land managers that they should take a more "aggressive" approach to removing dead trees or brush that could become kindling for fires. Firefighters often remove trees or brush to contain wildfires, but Zinke and other lawmakers argue that the government should more actively thin forests to remove potential kindling before a fire breaks out. Interior Department spokeswoman Heather Swift said there are no policy changes expected on the issue this year. Zinke also wrote in his op-ed that these efforts have been hampered by "frivolous litigation from radical environmentalists." Environmental and conservation groups have sued to block actions they called "clearcutting" in the past, arguing that removing brush from the forest floor could remove critical habitat for animals. In one legal decision a judge ruled that the U.S. Forest Service had to consult the U.S. Fish and Wildlife Service to make sure that efforts to clear kindling from forests was not disrupting the habitat for any endangered species.